The debt super cycle is a global phenomenon. The current global debt to GDP ratio is 350%. That is $200 trillion in debt vs. $62 trillion in GDP. GDP refers to Gross Domestic Product or the total size of the global economy. Debts begin to become unsustainable when they cross the 60% debt to GDP ratio. Beyond that point the initial boost to the economy that additional debt provides begins to diminish significantly. In the long term, debt always reduces growth because you are borrowing from the future when debt is taking on. The additional boost to spending in the short term must be met with sacrifice in the future to pay back the debt - plus interest. This is where we find the world today. It has borrowed $200 trillion from the future and now the bill is here to pay. What are the consequences of this? Significantly lower growth from the highest debtor countries, corporations, and individuals around the world. In order to overcome this mountain without a slow down would take a massive increase in growth for the total economy and incomes. Remember that the government borrows from both the people and the companies that exist within the states borders. Not only do individuals and corporations have debts of their own to deal with, but they must pay back the wild spending of the governments through current and future taxation. The problem with cutting spending and raising taxes is that it slows down growth in the short term. For some nations a slow down in growth means reducing the total GDP and total tax intake. By doing the right thing it actual adds to the deficit problem. This is what is occurring in countries like Spain today as any austerity is being met with revolt in both the bond market and from the people. They are boxed in a corner, and they have reached what John Mauldin calls in his excellent book "The Endgame." We will see moving through this outlook that many of the developed countries around the world are already at this Endgame, only the bond markets have not recognized it yet. Countries like Japan and the United States have no possible way of avoiding their predicament without a crisis. 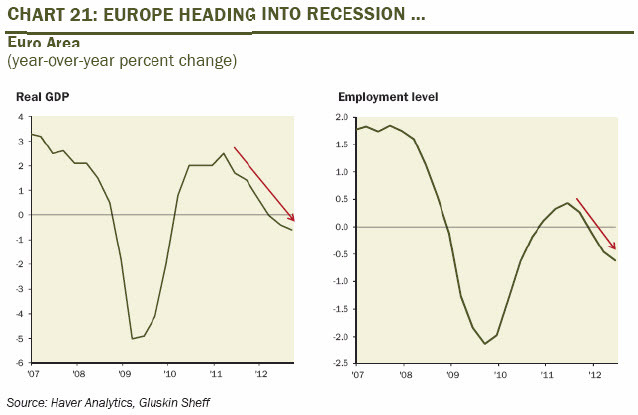 Slashing spending and raising taxes will bring on a deflationary depression. Raising spending and cutting taxes in order to try and outgrow the problem raises the risk of a bond market revolt. Up until late last summer we saw the first option being tested in Europe. Germany, still remembering their devastating hyperinflation during the early 1920's put a leash on the European Central Bank's ability to print money to purchase debt. That ended over the summer when the ECB promised to back stop a significant portion of the market. 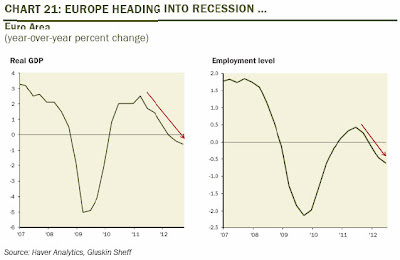 Economists and financial analysts looked at what took place in Europe over the last two years and concluded that it was the wrong policy response. Cutting spending and not allowing your central bank to provide unlimited printing will slow the economy in the short term. It is the equivalent of putting a drug addict into rehab. They will experience pain and withdrawals during the initial stages. With Europe now ready to unleash the printing press, they will join other developed powers like the United States, Japan, and the UK that have provided relentless government spending alongside unlimited central bank firepower. This brings us to where we are today. With all governments around the running full blast we will see if they will be able to outgrow the debt. It is my belief that they will not be able to do it. The burden this time has finally become too large. This will bring about the "change" to the financial system discussed during the introduction. Every individual and corporation around the world has put their full faith into their governments and central banks. If they fail, which they will, it will create a completely new paradigm shift, or awakening. This paradigm shift will create a dislocation in the market the size of which has never been witnessed in history. There will be chaos, collapse, and revolution. Most likely we will experience war during some portion of this process, which will be an unfortunate event to witness for those that understood the crisis and how it could be avoided. Battles will be fought over mistakes made the last few decades and paid for with unnecessary deaths of many people around the world. I will briefly discuss how the worst possible scenario could be avoided (war and collapse), but it is a futile exercise as I believe with 100% certainty that the wrong course of action will be followed. 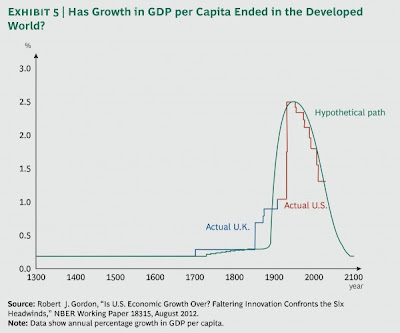 Many will argue that productivity, not growth, will save us. They conclude that there is some sort of new industrial revolution waiting around the corner that will take care of unemployment and income growth. The problem with this thought is that the actual productivity growth, which is still growing, is occuring at a lower rate every year. The reason is that the creation of hot water plumbing, electricity, and cars during the first half of the 1900's caused an exponential rise in growth per capita in the developed world. This growth reached a peak in the 1950's and has been falling since. The creation of an iPad over its predecessor, the laptop, provides a far less incremental growth in productivity than the creation of the car had over horses. 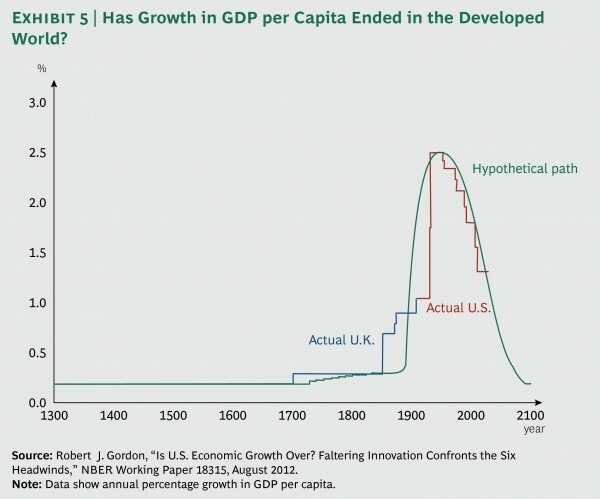 The following chart shows this exponential rise and exponential fall first in the UK then in the US when they become the world's economic super power. We understand now that the problem exists and that the final reckoning day, is upon us. Let's now look at the individual participants of this grand debt supercycle finale followed by the best estimate on how it will all play out. Just wanted to say that your analyses of the fundamental economic issues of the day are cogent, compelling, and much appreciated. I appreciate it. Much more coming. Very coherent analysis of the present situation. What happens post-awakening? Which types of investments are "safe havens" from hyper-inflation? Gold? I will give a full post-awakening investment blue print in the final section.